Do We Need to Be "Rescued From Capitalism?" There is little doubt that the global economy is experiencing at the very least a short-term meltdown. George Soros’ comments yesterday calling for more intervention and bailouts because emerging market investors need to be “rescued from capitalism” are comments that quite frankly send chills down one’s spine. After all, one does not need to step back too far in time to see how such thought processes led to communism when the same arguments claimed that capitalism was evil and prone to booms and busts. The problem is obvious: no one complains about excessive booms that are compressed into a short span of time with 30%-50% profits, but they immediately cry foul at the first loss of a dime. The problem we now face is preventing a true economic disaster if more people begin to think the unthinkable as Mr. Soros has just revealed. George Soros seems to understand all too well global capital flows. But he cannot have his cake and eat it too. Mr. Soros cannot on one-hand attack the currency peg in Hong Kong while he bemoans losing money on Russia because of an ill-placed assumption that it was too big, too important to fail. Once burned, George Soros is now groping for a new set of “rules” under which he may deal while placing at risk the balance of the world economy. There can be no global insurance policy for fund managers. They must NOT seek bailouts at taxpayer’s expense when what was called for is due diligence and risk management. Not giving fund managers and banks such a new set of rules may actually be the healthiest thing to do for the global economy in the long-term and the most moral for all societies at large. Capitalism is not at fault – only those who fail to practice prudent investment strategies and risk assessment. We should not now proclaim the death of capitalism just because of a modern 20th century South Sea Bubble. We have far greater problems that are festering than bailing out emerging-market hedge funds for their irrational exuberance. The world now appears to be fixated with the notion of currency devaluations and that this has been the culprit behind the trends that are now capturing the headlines worldwide. In the midst of this meltdown, the world now remains focused upon Japan and China as a key area to watch just behind Latin America. There has been one school of thought concerning the Japanese yen and Asia – A strong yen will prevent a devaluation of the Chinese yuan and ultimately the Hong Kong dollar. The problem with this view has been the focus upon currency rather than economics. Due to the fact that the South East Asian crisis has been highlighted by the collapse in the currencies of this region, the cause behind these events has been seriously misunderstood. Simply because the Asian Crisis was most visible in the currency markets does NOT mean that currency values are the problem. We simply cannot place the blame for this debacle on capitalism, speculation or currency movement without serious and unbiased investigation. It has been wrongly assumed that the Asian Crisis is a “currency crisis” when it fact it has been about irrational investment and excessive debt that has caused an unsustainable asset bubble. If we look at Hong Kong, indeed we have seen the government hold the currency peg at all costs. While the HK$ did not decline in value despite the fierce attack by investors and hedge funds, we see that the assets in Hong Kong took the brunt of the adjustment. Either the currency depreciates thus creating asset inflation or the assets depreciate caused by an overvalued currency. What we must be most concerned about now is that this misunderstanding could lead to a significant economic contraction in Japan that would lead to another 30%-40% drop in the Nikkei causing a banking nightmare. Within the last 3 months, membership values at the most prestigious golf courses in Japan have collapsed in some cases by 50-70%. From the bubble top in 1989, a 100 million-yen golf membership is now worth a scant 6.5 million yen, which is a staggering 93.5% decline. By Japan trying to talk the yen higher, they are in fact perpetuating the exact same outcome as has been experienced in Hong Kong – deflation through asset depreciation. This trend is not helping Asia but in fact may only prolong the global crisis in general and may lead to a significant Great Depression throughout Asia. No amount of IMF bailout will restore asset values. The excesses that were created by too much capital investment in these regions must simply be allowed to sort themselves out separating the weak from the strong. The mistaken view that a strong yen will stem the tide of the Asian Crisis is in fact perpetuating deflation within the Japanese economy, which is hovering over Asia as a major economic dark cloud. As long as a major recession/depression prevails within Japan, Asia stands no chance whatsoever of mounting a sustainable economic recovery, thus perpetuating the global meltdown. We cannot support the official position of Japan or certain members within the G7 that the world is in the midst of a “currency crisis” and therefore Japan must do everything it can to maintain a strong yen. This policy will push the global economy closer to the brink of serious deflation, which will ultimately culminate in asset deflationary trends both throughout Europe as well as the United States. This policy will in fact help create a bear market in equities, which in turn will reduce savings and consumer spending within the US and Europe thus causing both economies to import recessionary trends by means of deflation. We also cannot support cries from investors that taxpayer’s funds should rush to their rescue with bailouts for investments they should never have made in the first place. The argument that Japan needs to hold the value of the yen or else China will devalue makes little sense from a trade perspective as well. The primary issue here is that China and Japan produce totally different types of goods and that they do NOT compete against each other in any way. Therefore, the previous intervention ordered by Clinton prior to his trip to China was nothing more than a political ploy. There is no NEED to link China with Japan on this issue of currency or trade. However, the key factor remains that the fate of Asia is linked directly to Japan through economics exclusively. Maintaining a high yen will not solve the problems of Asia nor will it reverse the trends deep within the Japanese banking system. In fact, without foreign investment income, the Japanese banking system would be in severe danger of collapse. There is no opportunity for profit within its domestic economy and therefore capital has NO choice but to leave Japan. Ultimately, this trend will force the Japanese government to monetize its problems thus promoting the end solution to the emerging market dilemma – inflation. China’s problems are indeed similar to Russia minus the corruption and wholesale pillage of the nation by former communist leaders. Whereas valuable antiques have been pilfered in Russia (being replaced with copies as the originals find their way into the open market), China very much remains a nation with a high degree of social order. The economy in China also remains very much closed with inefficient Chinese state-owned companies, which cannot pay their loans, leaving state-owned banks on the hook rather than western investors. Therefore, the risks in China remain significantly different from that of Russia. Where Russia has collapsed into a state of chaos as the national wealth is being stolen from its people, the wealth in China remains intact yet overvalued and subject to an inevitable devaluation. Hence, a currency devaluation in China has already taken place on a black market basis. What will eventually follow is merely a readjustment between the “official” fixed value of the yuan with that of the black market. Such a move may again hurt the foreign investors, but it will stem the tide of deflation within China thus easing the social stress. Currently, the G7 is arguing against a devaluation of the yuan, which in reality is a form of protectionism. However, standing in the way of needed economic adjustment in China could also cause a retrenchment in capitalism. Others would like to blame the entire global meltdown on the doorstep of the Federal Reserve. Arguments that the Fed’s anti-inflation polices have allowed gold to collapse creating global deflation is absurd. We must realize that gold has NOTHING to do with the world monetary system. Its collapse has also nothing to do with the rise in the dollar but with the rationalization of European central bank reserves. Gold has also declined due to commodity based nations selling anything that has not been tied down including Russia and other third world states. Economic problems in South Africa have also caused selling while gold sales have been used to recapitalize the reserves in Korea. Gold has performed its function, not as a hedge against inflation, but as a store of value in the wake of currency depreciation as evidenced by events throughout Asia. Criticism that the world is melting down due to the Fed is simply ridiculous. The dollar rose dramatically during the early days of the Great Depression as well despite the fact that the Fed lowered interest rates. If governments are defaulting, capital flees to some safe-haven. 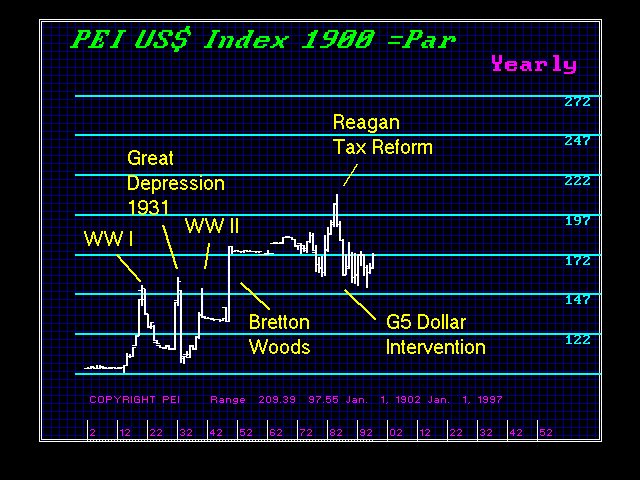 During the Great Depression, World War I and World War II, the dollar rose dramatically irrespective of the interest rates (see PEI US$ Index above). When capital is worried about being wiped out, interest rate differentials mean nothing. The most valuable commodity in Russia today on the street is the US dollar because of its recognition and liquidity. Capital is acting as it always has in the past and this is irrespective of current Fed policy. If the Fed had not been concerned about inflation these past few years, then we would have a huge bubble top here in the US and the discussion would be about US capital flight as has been the case in Japan. Again, this type of criticism is a call for monetization or inflation – not sound economic policy. We have heard proposed solutions that call for greater international government intervention through means of insurance programs, loans or guarantees. All such proposals currently being made are highly dangerous insofar as they lead to a one-world-government structure. The problems that we now face are not due to a lack of international attempts at controlling the world economy, but to the fact that such attempts have provided a FALSE sense of stability for emerging market investors who were attracted to 50% returns with delusions of no risk. Thanks to these organizations such as the G7, IMF and World Bank, excessive capital was attracted into emerging markets in Asia, Russia, Eastern Europe and Latin America. These economies were NOT mature enough to handle the amounts of capital that was thrown at them. About 50% of all mutual fund investments made prior to 1994 were for emerging markets. This excess capital was NOT used in a proper manner to create long-term economic growth but instead was misused for real estate booms in Asia or funding corruption in places like Russia. Thus the problem CANNOT be blamed upon the lack of guarantees for emerging markets but the lack of prudent investment strategies. Any fund manager who placed all his assets in an emerging market without consideration of the inherent risks knows nothing about history and received what he deserved. This boom in emerging-market investment simply has resulted in the transfer of vast sums of cash from the major economies to the emerging economies. These types of UNSOUND investments may be justified for 5% of one’s portfolio, but certainly not anything beyond that level. Investment conducted within emerging markets belong to the government level and should simply be viewed as foreign aid much the same manner as a company invests in research and development in hopes of developing the future – not quarterly profit reports. George Soros has argued that the current capitalistic system is flawed insisting that it does not always seek equilibrium but at times results in collapse. It should be pointed out that just because capital may act irrationally at times by concentrating within one sector, it does not imply that we should build new institutions of global proportions leading to a one-world-government. We must remember that communism was born out of an attempt to prevent the boom bust nature of the business cycle. As an investor, Mr. Soros would surely like to see such a system within which he could run to Russia, collect 150% and, when there is a problem, turn to taxpayers for a bailout. Nonetheless, it has been this very perception that the IMF would stand behind Russia at all costs that led many to think that Russian investments were ultimately risk free. Indeed, when capital is invested with irrational exuberance based upon assumptions that are totally unrealistic, such investments have ALWAYS, and without exception, been wiped off the face of balance sheets. What we are currently experiencing within the emerging markets sector is the true economic consequences of investment strategies without consideration of risk. This is certainly not new. All one needs is a history book to reveal what has happened each and every time capital runs off into emerging markets with wild expectations of making a fortune. Not only have countless losses been taken in Latin America time and again, but also we should not forget the widespread defaults of 1931 as well as the South Sea Bubble, which was just another emerging market boom and bust cycle. The consequences of the current global meltdown are just now starting to ripple through the financial markets in ways that you will not read in the headlines of our daily newspapers. In our view, the cash market, commonly referred to as the interbank market, is melting down on a day by day basis right before our eyes. Liquidity is disappearing in all markets due to the Russian default. Because banks suffered greatly following the Russia financial crisis, they are cutting back credit within the financial markets destroying liquidity and creating a credit crunch. The once prominent interbank market that boasted about a daily average trading volume of $1 trillion is not what it once was with the Russian default causing a rippling effect through all markets, including dollar/yen and dollar/mark, which will over time only lead to even higher volatility. The Russian default has also exposed the weakness of the IMF. The number one slogan used to solicit money for Russia was that “it’s to big to fail and has too many nuclear weapons” now stands naked for all to see the folly that took place. This false sense of confidence prompted undue credit risk within the interbank market and investment by fund managers now threatens to seriously reduce liquidity leaving the global economy exposed to volatility. Volatility will rise within the currency markets due to the fact a smaller amount of net capital movement will now have a greater impact upon price as the number of market-makers are reduced and remaining players shrink in size. In this manner, Russia has proven to be a far-reaching event beyond the scope of merely emerging markets. It is within this effect that we find the tendency toward a growing worldwide credit crunch causing a serious impact upon share markets while propelling both a domestic and international capital flight to quality. Clearly, the proposed approach of expanding the IMF both in capital and authority represents a dangerous threat to the stability of the global markets. Brazil alone would take $100 billion to fix and then what do we do with the rest of Latin America, Asia and Russia? Those who call for such massive intervention in fact may be looking for a bailout while over the longer-term placing the global economy at a significant risk. We must realize that a bailout is NOT support for the domestic economy or its population. Calls for a bailout are merely a means through which current investors transfer their depreciated investments indirectly to taxpayers. We should make no mistake about it. A bailout from leading major economies into the emerging markets is in effect a monetization of those assets. If the nations behind the bailouts seek to borrow rather than reallocate reserves, then they are transferring the deflation from emerging markets back into their own economies. The IMF strategy of holding the currency value at all cost by means of excessive interest rates like in Brazil of 50%, in effect causes a sharp rise in the current account deficits of these nations. The capital investment into a country move through the “capital account” while all interest and dividends paid to foreign-investors move through the “current account” thus causing explosive growth. When a current account deficit rises sharply, this is normally seen as a sign that the currency must decline, and as such, the problems are only accelerated, as was the case in Russia. Still, others have proposed expanding international government by creating additional agencies in a vain attempt to control the world economy. Any proposal for an expansion of international government agencies represents a dangerous trend toward an international one-world-government approach that in and of itself would violate the principles of representative forms of government. We must remain highly cautious about proposing international bodies of government agencies when we already have the IMF, which continues to remain unaccountable to sovereign nations and their populations. The IMF’s refusal to provide any transparency whatsoever on its policies and operations is an insane proposition. IMF policies can be carried out in a dictatorship without accountability to the world community, as has been the case currently. In our view, the boom bust cycle of investment has been going on for centuries. There are accounts of similar emerging markets crises during the days of Ancient Rome and Greece. Such boom and bust cycles cannot be prevented and should not be prohibited or will end up with the Russian economy model. However, we do believe that they can be reduced in terms of amplitude through rational management. In order to achieve such a solution for the future requires to some extent the restriction upon net capital movement with regard to concentration of assets. In other words, asset classes should be regulated to restrict banks from becoming too over-weighted within one asset class in the same manner that a bank is not permitted to lend too much to one company or individual. Likewise, fund management should be consolidated. This suggests that there should NOT be two competing agencies such as the SEC and CFTC. The regulations between these two agencies are so conflicting, that the fund management industry itself becomes fragmented, thus causing a proliferation of funds that are too narrowly focused. This then shifts the burden of investment strategy down to the average person on the street. This lack of consolidation within fund management has led to the bombardment of advertising targeting the general public that in turn has led unsophisticated investors to pour money into emerging markets. Thus, over-regulation has created a capital industry that causes investment to rush back and forth based upon “hype” rather than a coherent strategy. For this reason, a consolidation of the fund management business would be a welcome relief for capital. Such a consolidation should be carried out in a manner that allows an investment house to make the strategic asset allocation rather than the general public at large based upon advertising. At the same time, regulation that prohibits any single asset class, other than cash, to rise above perhaps the 20% level would relieve the stress within net capital movement thereby tempering the boom bust cycle through preventing excessive capital concentration. Such regulation should take into consideration market cap as a factor thereby preventing too much capital being poured into economies that in turn cause excessive expansion without building a solid economic infrastructure. This would avoid the problems we have seen in places like Malaysia or Russia where neither economy was able to efficiently absorb the foreign capital seeking investment short-term performance with long-term expectations. All things considered; intervention or regulation CANNOT eliminate the boom bust cyclical nature of the free markets and at best we should only seek to reduce amplitude BOTH on the upside as well as the downside. It is even arguable that such economic trends are overall beneficial for long-term growth by sorting out the weak from the strong. Hence, Malaysia will now seek reforms within its domestic economy that will eventually lay the foundation for a more sustained economic growth long-term in the same manner as the US reforms from the Great Depression. The purpose of regulation should ONLY be to moderate the amplitude of such moves and NEVER attempt to prevent or eliminate the overall nature of the business cycle. Excessive borrowing that FAILS to provide direct forms of economic growth that are sustainable has ALWAYS been dangerous and can cause the total collapse of nations. We have seen such catastrophic events time and again throughout history from Rome and Greece to Philip V of Spain and into the 20th century with the collapse of Europe in 1931. This may indeed now be unfolding in Russia from which we can only see revolution, chaos and perhaps civil war. No amount of capital will cause true reform in Russia and in fact will only fund investors still looking to bailout. If we can draw only one shred of guidance from history, we cannot guarantee the world economy by pouring money down an endless drain. The only way out of this dilemma is to allow the deflated economies to inflate through devaluation. We must NOT forget that Franklin Roosevelt himself brought the Great Depression to an end ONLY by the confiscation of gold followed by a devaluation of the dollar by 69%. There can be no overnight solution where someone pulls the rabbit out of the hat and the world functions as it did before July 20th. We cannot now expect to save the world without the yen declining significantly and allowing that economy to begin to monetize. Arguments that the G7 must encourage demand-led domestic growth in Japan cannot be accomplished without also inflating the economy, which means a weaker yen moving back to 1985 levels of 200-300 to the dollar. Likewise, we cannot expect to argue against further devaluations around the world in China, Asia and Latin America for fear that Europe and the US will be flooded by cheap imports. Perpetuating global deflation to save domestic jobs will not work either and ultimately we will risk a global depression that could even lead to war. If Brazil continues to defend its currency at all costs, Latin America will collapse since Brazil is 47% of the entire region’s GDP. We must also keep in mind that Malaysia’s actions of closing its economy may in fact become necessary in other emerging markets. We cannot demand that all markets remain open simply due to theory. There are times that a nation must simply turn away from the world in order to allow its economy to readjust – the word is “moratorium”. 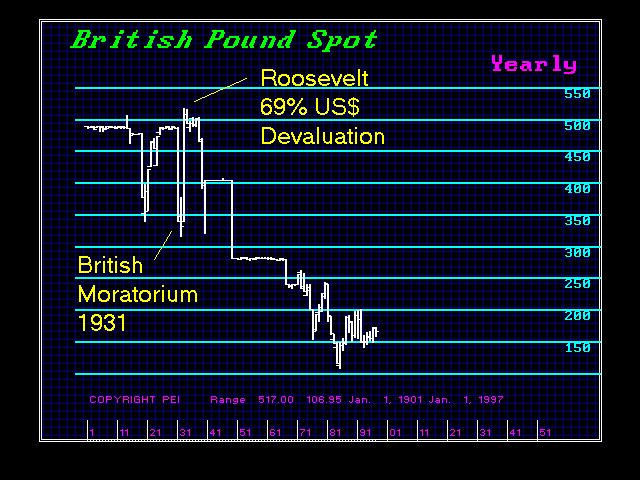 When Britain was forced off the gold standard in 1931, they too suspended all payments for about 6 months. This badly needed time ended the bleeding for Britain during the Great Depression and its economy eventually recovered, fairing the depression far better than the US experience. The lessons from the 1930s are clear. Those nations that did default underwent inflation, while deflation was imported into the US because it clung to the gold standard, which caused massive internal deflation. Those nations that allowed their reserves to vanish suffered tremendous social upheaval and significantly wiped out their economic capacity to recover. We must not UNDER ANY CIRCUMSTANCE bailout these fund managers who went into emerging markets touting long-term growth potential. The long-term potential in these economies may still exist if they are allowed to move into a moratorium instead of a duel to the death because of a short-term panic. South East Asia will recover IF we are sensible about the current causes of events. These economies are attacked NOT due to pure currency speculation, but largely due to the desire for capital to leave. Losses such as Russia cause capital to run away from emerging markets globally as an asset class. If we try to hold these currencies at all cost, we end up with the same effect as a run on a bank. A bailout will NOT serve to reverse the expectations, but only fund capital-flight as has been the case in Russia leaving a gutted economy behind. Excessive capital inflows into emerging markets have caused rapid expansion and overvaluation in the same manner as misguided US tax incentives caused excessive investment into real estate. When the bubble finally burst, following changes to the tax code, capital-flight from this asset class resulted in the S&L Crisis. This is the very same cause and effect that is now engulfing the world as well as the Japanese banking system. Whenever capital concentrates within one sector or region, bidding prices to unrealistic levels for whatever reason, we create the unsustainable boom-bust cycle. The emerging markets will come back IF they are allowed the time to adjust and reform. China will emerge as a strong economy for the 21st century IF we stop demanding the same insane policies imposed by the IMF on Russia. Even the Japanese banking system will survive IF true reforms are undertaken. We must step back from the edge before the entire global economy slips off into a sea of political and economic uncertainty. IF WE DO NOT, then we raise the risk of war that has always historically followed as a consequence of our economic stupidity.